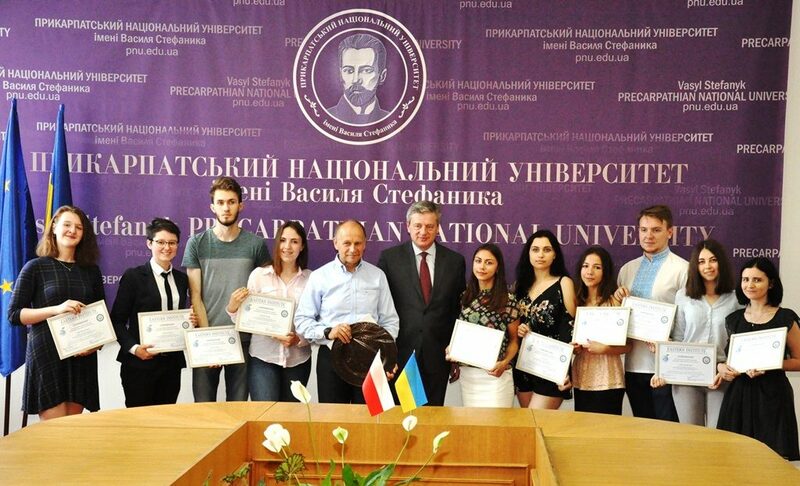 The students of the Precarpathian National University have become the first scholarship holders of a noted East European Research Institute in Ukraine. This became possible thanks to the singed bilateral agreement on cooperation (June 12, 2018) between the Fund of East European Research Institute (Warsaw, Poland) and Vasyl Stefanyk Precarpathian National University. Sigmund Berdykhowski, the founder of the Fund and chairman of the Program Council of the Economic Forum in Krynica-Zdroj, attended the grand meeting himself (well-known as Central European Davos). During the meeting with students and lecturers, the founder of the Fund Sigmund Berdykhowsky and Rector of the University Igor Tsependa signed an agreement that provides for awarding scholarships from the Fund to the best students of the Precarpathian National University during the school year. “This is a significant event for our University. The signed bilateral agreement, initiated by the founder of the Fund, the chairman of the Program Council of the Economic Forum in Krynica-Zdroj Sigmund Berdykhowsky, is aimed at supporting gifted students of our University, celebrating their scientific achievements and promoting their knowledge, skills and abilities. Our students are the only ones in Ukraine who have become scholarship holders of the Fund of East European Research Institute. For us, this means that the activities of the collective bodies of the university have been highly appreciated and we have gained a great deal of trust from our partners” – said in his welcome speech the rector Igor Tsependa. He also thanked Sigmund Berdykhowski for his visiting the University and his considerable support of Ukrainian students. Sigmund Berdykhowski also thanked to Rector of the University Igor Tsependa for longstanding partnership and personal contribution to the development of international relations between Poland and Ukraine. the honorable guest also highly appreciated success of the Precarpathian National University in implementing international projects, noted the high academic attainments of lecturers and students in international programmes. He assured his personal further support and expansion of cooperation. After signing the agreement, Sigmund Berdykhowski presented certificates for the Fund’s scholarship to the top ten university students. The Fund’s Expert Committee decided to mark the students who are major in the areas of tourism, natural sciences and economics. The main criteria for evaluation were the command of English at level B2, the average academic performance (not less than 4.5). An additional advantage was their knowledge of the Polish language. So, now and during the academic year, students will receive a monthly scholarship in $100 equivalent. Sigmund Berdykhowski invited scholarship holders to participate in the XXVIII Economic Forum, which will be held on 4-6 September this year. Nowadays, the Krynica Forum is considered the largest and most famous event where the most powerful representatives of the world, politics and business of Central and Eastern Europe meet. Important declaration related to economic policy have been announced for many years in Krynica by prominent statesmen and their statements are quoted by the world media and discussed in expert circles. At the end of the meeting, Sigmund Berdychowski announced a competition of master’s works in the framework of the project “Europe Carpathians”, the winner of which will also be granted the Fund Award.